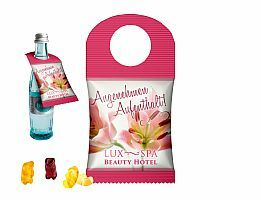 Magna sweets vividly demonstrates how even the very last bottle can become a high-impact promotional messenger thanks to the BottleBag. Punched with a hole, the individually imprinted promotional bag made of white OPP laminate film that was distinguished in the category Give-aways can simply be hung over a bottle. What’s more, containing fruit gums or optionally nuts, the item is also equipped with a small in-between meal snack. Whether for a trade show or event, conference or seminar, wellness hotel or trendy club – the BottleBag can be implemented wherever bottles are found, whereby it can also be hung over the door handle or handlebars of a bike. The large-surface advertising messages are guaranteed to attract attention.